Just one week ago, we took a look at a leaked video that gave viewers a quick walk-through of what was purported to be HTC’s yet to be released Sense 6. While the veracity of the leaked video is still unknown, we do know that Sense 6 is on the horizon. It’s only a matter of time before it reaches consumer devices—well, if the company doesn’t go under before then due to poor sales and perplexing legal practices. So naturally, the question on everyone’s mind is when and if their current generation HTC devices will receive the HTC Sense 6 goods. Well, thanks to leaked documents courtesy of XDA Recognized Contributor and leaker extraordinaire LlabTooFer, we now have a better idea. HTC One owners will be glad to know that they’re first in line for the Sense 6 update, as HTC appears to have tentative plans to release the update some time between May and June. One Mini, One Max, and Butterfly S owners should also find comfort in knowing that they’re scheduled to receive the update one month later, some time between June and July. Unfortunately, this means that other devices such as the original Butterfly, One X, One X+, One S, One V, One SV, Desire 601, Evo 4G LTE, and Desire 700 are probably going to be left in the cold—but we already expected as much. Another interesting tidbit that can be gleamed from the leaked documentation is that Sense 6 is also currently running atop Android 4.4.2—just like Sense 5.5 does at present. However, it’s not uncommon for different versions of Sense to run atop the same Android version. 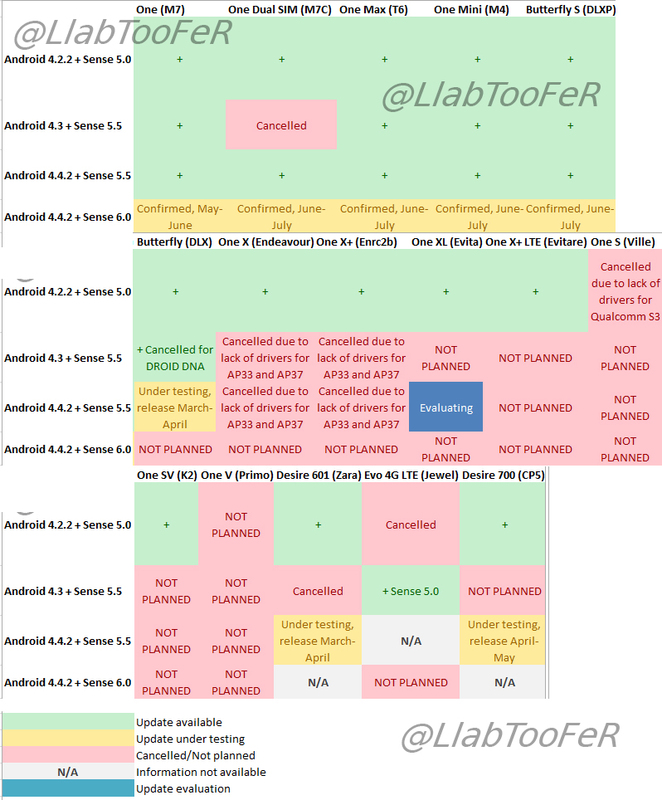 What are your thoughts on HTC’s update schedule? Are you still bitter about the lack of updates for the One X and X+? Let us know in the comments below!